For those seeking to get an early jump on the 2011 rookie class, there's already a handful of choices for collectors to choose from - 2011 Sage Hit, 2011 Press Pass, 2011 Leaf Metal and the surprising addition of 2011 rookies to the just released 2010 Exquisite Collection. The situation I'm about to present offers a picture perfect example of how an autograph isn't everything, especially in the world of pre-draft football cards. 2011 Sage Hit, 2011 Press Pass and 2011 Leaf Metal Draft each offer collectors autographed cards featuring big names from the 2011 NFL draft class, while Exquisite Collection does not. Yet, without question the cards with the greatest long-term potential are those seeded in Upper Deck's Exquisite Collection. What makes these cards extremely intriguing is that they are part of a distinguished collection, the legendary $500+ per box Exquisite Collection. When it comes to long term value, brand matters a great deal. When you pair the "Exquisite" factor with the fact that they are the first officially licensed cards featuring 2011 rookies and numbered 99 – you are left with the conditions for the perfect trading card storm. Though 2011 Leaf Metal Draft singles are selling extremely well at the moment, the product is nothing more than a pre-draft novelty that lacks a license. Albeit it's a decent looking novelty, but that doesn't change its long-term outlook in the least. In fact, before Sage, Press Pass and Leaf had even released I had already ruled them out as possible purchases. The reason is simple, unlicensed off-brand cards always become obsolete once the big brand products hit the market. While Exquisite doesn't feature the NFL license, it does feature a more than legit NCAA license. With the success of NCAA products like 2010 Sweet Spot, 2010 SPx and 2010 SP Authentic, it's abundantly clear that the college collecting market is growing by the second. 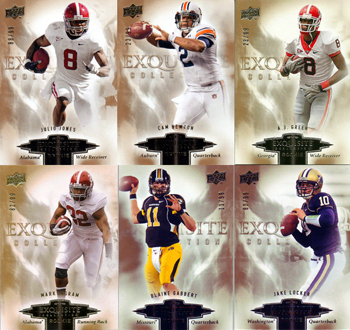 I'm not suggesting you rush out and pay $200 for a 2010 Exquisite Cam Newton, but I do suggest keeping an eye on these, as they might be the most legit pre-draft football cards in the history. I usually don't even consider buying football cards until late-summer, but Exquisite's have more than caught my eye. Seeing as how I can't afford to rip a box of 2010 Exquisite or grab any of the set's high-dollar 2010 rookie patch autographs, I've been targeting a few of my favorite sleepers from the 2011 NFL draft class. For collectors not willing to fork out $100-$200 for names like Newton and Gabbert like myself, what I would recommend doing is targeting sleeper skill position players (QB, HB, WR) and see if you can't grab one for between $10-$50.